TIPS is a new market infrastructure service that the ECB launched this month. It enables payment service providers to offer their customers the possibility to transfer funds in real time and around the clock, every day of the year. This means that thanks to TIPS, individuals and firms will be able to transfer money between each other within seconds, irrespective of the opening hours of their local bank. TIPS is developed as an extension of TARGET2 and will settle payments in central bank money. Even though they said that at the beginning, TIPS will only settle payment transfers in euro there was the sentence that, in case of demand, other currencies could be supported as well. Some of the benefits of the system will include no minimum wait during the transaction process and the surprising fact about the instant payment system is that it allows the currency to be settled in the bank at any time creating an all-time all access system. Alleged Ripple partner and Pan European infrastructure, Target Instant Payment Settlement now went live with the primary purpose of creating an instant payment system all over Europe using the central bank as a channel to regulate the transfer of settlements enabling the transmission of digital money across the border and Europe as a whole. And as ‘instant payment settlement’ term is attached to the service, multiple anonymous sources have reported that they have turned to Ripple blockchain. Some see this as the beginning of the end for crypto assets: centralized institutions are responding to the challenges posed by crypto and are beginning to take action. Others, however, see it as promising for crypto. The one thing is sure. This certainly is a good thing for cryptocurrencies and decentralization. In fact, it could be a game-changer for Ripple’s various payment technologies because there are signs that TIPS could implement Ripple technologies like xCurrent, xVia, and xRapid in the future. The first two are powered by Ripple, while the third is powered by the XRP digital token. It’s possible that TIPS will utilize some or all of these technologies to facilitate cheap international payments. The reason is that Ripple has partnered with TAS Group that has several important partnerships with banks in Europe. Its latest version of their Bank Liquidity Management platform is specifically designed to offer maximum interoperability with the TIPS payment standard. Banks can use TAS Group’s Bank Liquidity Management Platform to seamlessly transition to the new TIPS payment protocol. Why Is TIPS Similar to Crypto? TIPS works in a similar way to payment platforms like Ripple’s xCurrent. With TIPS, payment service providers are required to set aside a portion of liquidity in their country’s central bank. This liquidity will be used to settle payments instantly with no waiting times, 24 hours a day and 365 days a year. The end-to-end processing time from the beginning of the transaction to the end is expected to be 10 seconds or less. The system already has plans in place to scale effectively to meet the needs of users. There are two features of TIPS that will help it achieve reachability across the whole of Europe. 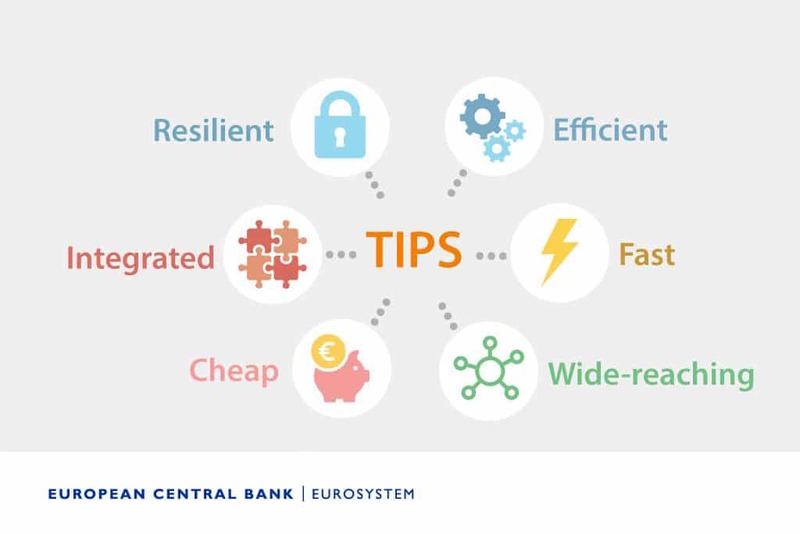 First, TIPS is based on the SEPA Instant Credit Transfer (SCT Inst) – a scheme for pan-European instant payments, expected to be used by a large number of payment service providers across Europe. Second, TIPS will be developed as an extension of TARGET2, which already has an extensive network of participants across Europe. Although it will use euro for settlement, this will be one of the most significant milestones that could ever happen in euros technology concerning the world of digital currency. The involvement of Ripple blockchain is yet to be confirmed, but the nodes match quite well. Do you believe in Santa Claus? If you do, you probably believe that Coinbase will add Ripple (XRP).